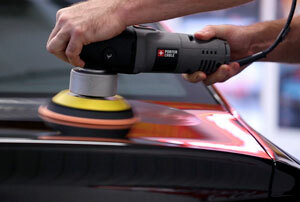 Buffing or polishing (the terms mean the same) a car used to be a job only professional detailers could do correctly. When polishing, you’re essentially smoothing out the surface of your vehicle by removing a thin layer of clear coat (clear layer on top of paint). This is done to remove deep stains, oxidization, and small scratches. While technically possible to do by hand, the result is MUCH better and easier by using a car buffer/polisher (especially the large surface areas). 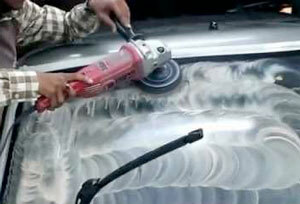 Even the best car buffer can damage your paint if you don’t know what you’re doing or try to rush through the job. Fortunately, polishing a car isn’t all that difficult if you take your time. It’s just one of the steps in detailing your car. Dual Action (DA) polishers (or random orbital polishers) are more forgiving since they both spin and wobble which means much better heat dissipation if you leave the polisher is one area too long. In other words, you won’t burn through the paint as you easily could with a normal rotary polisher. Not only can a car polisher “repair” and smooth out the car’s exterior, it can also be used to quickly apply wax to protect it. Whether you want to make your car to have that glossy shine once again or are looking to start your own auto detailing business, one of these car buffers would be a great start. Rotary Polisher vs. Random Orbital Polisher – What’s the Difference? 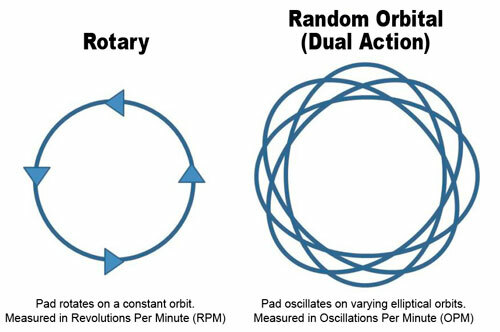 Random Orbital vs. Dual Action – What’s the Difference? Buffing vs. Polishing – What’s the Difference? Can I polish car windows? 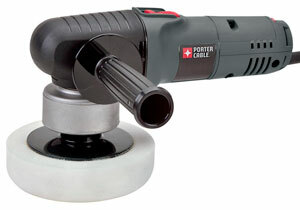 According to seasoned pros, the Porter-Cable 7424XP is the best random orbital polisher in use today. Its compact size and ease-of-use make it excellent for amateurs, DIYers, and even professionals. Also, the 6-inch backing plate smoothly fits the majority of foam pads, alongside the motor that’s capable of generating 2,500-6,800 orbits per minute (OPM). The handle is totally ambidextrous, enabling you to shift it from right to left, at will. This is primarily because a proprietary counter balance is put-upon the 6″ sanding and polishing pad to assist with even coverage. While it may seem ultra-fast, it’s exceptionally safe for your paint. The variable speed control option is engineered behind your palm to make an accidental speed switch difficult. It is to be noted however, that the Porter-Cable 7424XP can nearly pull off any buffing job, but a few customers have raised concerns over the quality of the pad included, and that the vibration at higher speeds can cause some hand fatigue. Say hello to, arguably, the best dual action polisher that enables you to easily buff your car at home like a professional, even if you’re a beginner. Visit any car enthusiast online forum, and you’ll notice Griot’s Garage products recommended all the time. This DA polisher offers the ability to remove almost any paint imperfection you can imagine, including swirls, water spots, oxidation and even mild scratches, courtesy of its potent 7-amp motor that delivers a thumping 850 watts of buffing power. It’s available with either a 10-ft or 25-ft power cord so if you want to avoid the hassle of having an extension cord, you have that option. The buffer is about 12″ inches long, and is a comparatively smaller than the other products we’ve discussed. 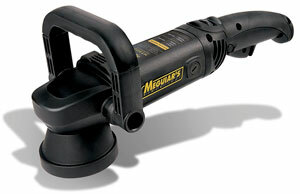 However, its rubber coated, 6-position handle makes buffing ultra-easy with either hand. A few users noted they received a product that was DOA, but customer service quickly replaced the product. The Torq TORQX (by Chemical Guys) can pull off almost any auto detailing job since the kit comes with all the accessories required for a total paint correction. Specifically, it comes with the TORQX DA polisher, three Hex Logic buffing pads to cut, polish, and finish off, and the V-Line sampler to remove scratches and swirls from any painted automobile finish. The product features a balanced internal design, a 680-watt motor, OPM of 2800 to 7800, and the ability to use 4″, 5″, or 6″ pads. The Torq TORQX allows you to buff away any stubborn compounding marks as well as alleviate the gloss to show-quality, courtesy of the White Hex Logic polishing pad. 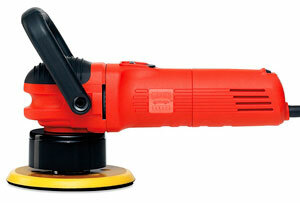 The polisher is durable and easy to maneuver with little vibration. A majority of users have termed the buffer sturdy enough to last for years. At barely over 4 pounds, the Torq polisher is the lightest of our recommendations so if you have hand fatigue issues, this is the buffer for you. While the overall design is good, some have found that the speed knob is in a location where the palm of someone’s hand could inadvertently change the speed. The location of the on/off switch is also questionable but that’s getting nit picky. Meguiar’s ergonomically designed buffer is light in weight and just about the right size, making it super easy to operate. The multi-position D-Handle allows you to use whichever hand you prefer to remove surface contaminants with minimal effort. Its Digital Torque Management system enables automatic adjusting of torque to maintain the speed level, while the Thumb Adjustable Speed Dial with a speed range of 3000 to 7500 orbits per minute (OPM) makes buffing highly effective. The machine’s orbital throw is 8mm, and it doesn’t seem to have any overheating problems. We love the soft start feature, which offers you a smooth start, and keeps the compound from splashing all over. Some users note that the noise and vibration at higher speeds is a bit higher than it should be for this price range. If reading reviews of this product on Amazon, keep in mind that Meguiar’s also sells polishing pads on the same page so most reviews are about those. The dual action Presa Turbine buffer is another good option for the weekend warrior and hard to beat in what you get for the price. It allows you to polish your vehicle with 600W of power working at a speed of 1500 to 6800 OPM. The auxiliary accessories include a hard compounding pad, a soft and medium polishing pad, wash mitt, a microfiber cloth, and carrying bag. 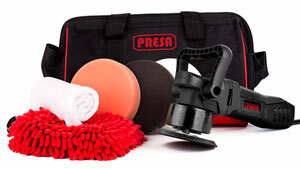 With the Presa Turbine Polisher, you experience complete control and personalized comfort. In addition, the soft start function prevents the buffing compound from splattering everywhere, and is also smoother on the counterbalance bearings, thereby offering less vibration and a longer life. Lastly, the almost 20-foot power cord allows use without an extension cord, and also includes a Velcro strap for hassle-free cord management. The biggest negative with this kit is actually the included pads. They’re simply not the best quality and many users have reported them falling apart after limited use. You’ll likely want to switch to aftermarket pads for peace of mind. Also, the build quality is not quite up to par with our other picks but for the price, it’s still a big improvement over a typical rotary buffer. A typical rotary polisher has a direct drive motor where it uses an auger (or spindle) to spin the polishing pad in a clockwise motion (when viewed from the top). While this setup is efficient, it’s quite aggressive in that it goes over the same area over and over. If you’re not careful, you can easily go through the clear coat layer as well as a layer of paint underneath. A random orbital polisher on the other hand uses a motors and drive units to spin the polishing pad in two different ways: the pad face rotates in a large circle while the pad also oscillates in many small circles within that large circle. There is no difference. Random orbital polisher is the more popular term but dual action (DA) polisher is simply another name for it. Here again are two terms that mean the same. When you buff or polish something, you’re essentially making its surface smooth. Yes, you can! It’s the best way to get rid of what seem to be permanent water spots and even some light scratches. Once polished, follow up with a thin coat of wax to get a long lasting Rain-X type effect. I want to fix my headlight lenses. Some use a car buffer after sanding with 1000 grit Emory. Some just use a rotary buffer. Please comment on rotary or DA. I personally don’t use a buffer for headlights. Since you’re dealing with such a small area and precision is important, I’d recommend using blue painter’s tape around the headlights and wet-sanding by hand using 1000 grit sandpaper. Careful wet sanding will remove most of the haze. Follow up with a polishing compound.